When Ghost emerged from the occult rock swamps they made a lot of heads turn and ears tune in to their papal pomp. But while music is indeed a subjective experience, there was mild hum of disappointment that their second album was not quite the opus we were expecting, plumping for middling organ-grinding odes rather than imperious anthems. But patience is a virtue for the damned, too, and those worshipping at the Satanic altar of the riff are bound to be throwing a few more horns for Meliora. From the chorally-guided march of opening track Spirit and the sleazy chime of From The Pinnacle To The Pit, pilfering ‘that riff’ from Priest’s Painkiller, through to the dark offerings of Cirice, the onward into battle canter of Majesty, the Oompa Loompa sermon of Deus In Absentia and Mummy Dust’s horror show aesthetic, this is a diverse and thrilling concoction of melodically spun nightmares dripping in riffs and solos and given a dulcet sheen with those recognisable Ghost harmonies. 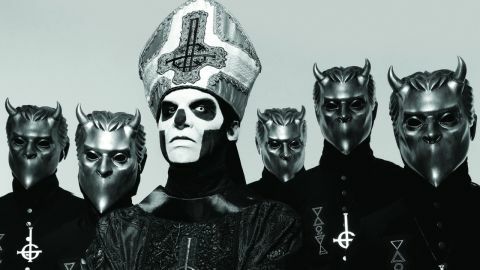 If The Beach Boys or the Mamas And Papas did Maiden it might come close to summarising this band – and whether you believe that the third embodiment of Papa Emeritus is indeed a new frontman, Ghost’s latest incantations are worth the praise.